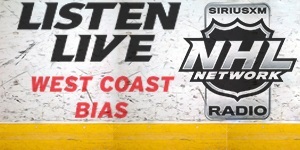 GM Rob Blake held a media call early Thursday to share a few thoughts about what lies ahead. With that in mind, we asked Blake if there have been any changes in draft preparation this year, compared to how things were done under the previous regime. Naturally, this lead us to a conversation with Yannetti, who we have found to be one of the most intelligent and insightful people in the organization over the past 10 years. 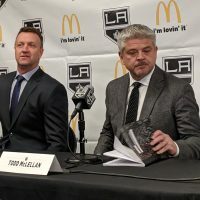 “In terms of goaltending depth, I don’t think there’s a team in the league that’s had the goaltending depth we’ve had,” he began, as we asked about the need to restock the team’s pipeline of goaltenders. “In the span of two months [last year], we went from having maybe the best goaltending depth to maybe the worst goaltending depth. Going into last year’s draft, I would have said it was of paramount importance for us to come out of that draft with a goalie. It was a focus and it was extremely important. As you saw, we did not get a goalie in last year’s draft. I would say the same thing today – going into this year’s draft it is very important for us to get a goalie. However, as has happened in the past, we’re not going to get a goalie just to get a goalie. “You spend 16 months – and sometimes longer than that – creating a list. You spend countless hours doing detailed work, going over your list and getting it in order. Last year, at Kale Clague’s pick [No. 51 in the second round], Kale Clague was the guy on our list. We did not take a goalie. At Jacob Moverare’s pick [No. 112 in the fourth round], that was the guy on our list. We did not take a goalie. In the past, when we have not adhered to our philosophy, and not adhered to our procedures, we’ve had disastrous results. When we’ve tried to chase a defenseman here, or toughness with this pick, or size here, it just doesn’t work out. Assuming it’s easier to be patient in the earlier rounds, we wanted to know how difficult is it to maintain that level or patience/commitment as you get into the later rounds, where you may start to feel the pressure of running out of picks that weekend. “I find it very easy to be that disciplined when you’ve made mistakes in the past,” explained Yannetti. “I think one of the hardest things in life is to truly self-critique. I don’t think there is anything harder than to be completely honest when you look in the mirror or when you evaluate yourself in any way – as an employee, in your personal life, whatever. Understanding your shortcomings, embracing them, and addressing them is extremely hard. If you apply that to this scouting – biases creep in, whether they are conscious or subconscious. There was once a time when the perception was Europeans weren’t big enough or tough enough to play in the NHL. And at another time, it was college kids. That singular, linear way of thinking was so limiting. Think of how far ahead of the game you would have been if you could have stayed away from that way of thinking. It’s easier to adopt the mentality of the herd; it’s a natural thing, you can hide. As soon as you stand out, you open yourself up to criticism. However, you also open yourself up to success. “When I tell you it’s easy, it’s because we didn’t learn from our mistakes the first time we did it. When you make that mistake twice, it becomes a little bit easier to learn from it [laughter]. I’d like to think our staff is at the point where we can honestly assess our innate biases and our shortcomings. The good thing about being with the staff for so long — in the past, I would say I didn’t think our work-ethic changed, I never thought our diligence changed, but I’ve also thought we may have gotten stagnant because we believed in a model so whole-heartedly that we didn’t make that model evolve. We spent so much time trying to develop a model for success, we put so much effort into it, and we were creating a model because there was no previous model in LA. There was no culture to fall back on. There was no blueprint for winning to fall back on. When you finally reach that pinnacle, it becomes almost limiting. You get a sense of tunnel-vision. Actually, what you’ve done is taken a thought, a hypothesis, and you’ve re-worked it, over-worked it, and thrown it out and brought it back. In essence, it’s the same philosophy you started with; but in practice, and reality, it’s undergone almost a countless amount of minute changes to get it to the point it is. You forget that evolution, and that constant flow of ideas, both right and wrong, is what led to the model being where it was. You get stuck there. Now I see it. At the time, you can’t. So, back to the goaltending depth. It seems pretty safe to assume the team will need to acquire a goaltender or two this offseason, if at least one isn’t taken at the draft. 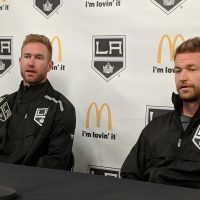 Building upon what we asked Blake above, we also wanted to get Yannetti’s perspective on how, if at all, the Kings draft philosophy has changed since 2012. 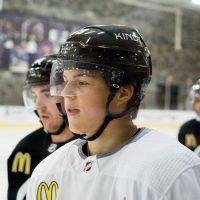 “What happens is you recognize that there’s a philosophy in terms of what we think makes up a King: intangible, immeasurable hockey statistics, things that analytics can’t measure and that the naked eye can’t see,” he began. “It’s not a perfect world, not everyone is going to have them or have them at the same level. But you look at a player and you get to know him, you look for things like with Tanner Pearson and Toffoli. You say to yourself, ‘This kid is going to get it. His core values are coming into line with our core values.’ Now, you get into the nature versus nurture and our development staff. You get into Nelson Emerson, Mike O’Connell, Glen Murray, Mike Donnelly. Where does the nurture come from? That is where it comes from. You look for people that have at least some of it, so nature is a part of this. I’m not sure you can put in what isn’t there, but you can certainly mold, enhance and emphasize some things that aren’t quite developed but are still there in the background. That’s where Emerson, O’Connell, Murray and Donnelly come in. Our amateur staff from 2007 on, regardless of metric, is at the top or in the top two or three of every category of development. We’re not a bottom team, we’ve won two cups and been successful. Our draft picks have exceeded the norm. There’s a reason they have. As proud of our amateur staff and scouts as I am, the development staff has as much of an impact in that success as they do. You go to Chris Haijt and Mike Stothers. Development is their job. “These players are Kings players because of the passion of our development staff and the fact that the staff is at the top of the field. That’s why you can say Toffoli and Clifford both embody what a King is, but there completely different players. It isn’t just the drafting of a player. You look at some of the later round picks, Alec Martinez embodies what a professional is. He is the very definition of it; arguably the best student of development we’ve ever had in LA. That isn’t to diminish anyone else. Many of them would be at the top of their class in any other organization. Martinez had gone through the draft and was a fourth round pick. We certainly didn’t view him as a fourth round pick. Why does he embody what it means to be a King? It was inside him, but 15 people had a role in making him the player he is. He had the biggest role, but there was a support staff. The amateur staff gets a lot of credit for drafting him. That guy changed himself and has made himself what he is. There are five development coaches, two sets of AHL coaches, two set of NHL coaches who have all made him what he is. The amateur staff is the foundation on which you build your house. They are the initial architect but are by no means the sole architect in what is being built. 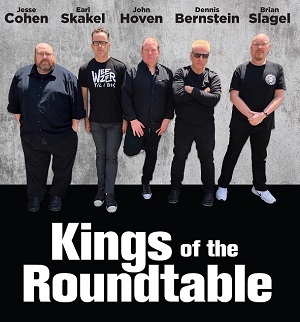 So when we draft a typical King, they’re not a typical King. “The evolution of who we would’ve taken then to now is not as much as you might think. There are things that I’m learning. Defenseman I never thought could help a team win can help a team win. I’ve seen teams win with defenseman I deemed incapable. You think there are players that can play in the NHL and there are players that can help you win in the NHL. There are players i have now seen win cups that philosophically I didn’t think could win cups. I thought they were NHLers, i recognized that, but intangibly we thought they needed something more. There are somethings that we consider so highly that if that attribute isn’t at the given level, they can’t help you win. Certain attributes compensate for that lack. We thought there were some areas that a player needs, that we can’t win without. Maybe those areas have now pushed towards the middle that were at one time on opposite ends of the spectrum. In terms of that, it’s changed. Circumstance has a lot to do with drafting. If you are not picking in the first round for five out of seven years. If you expect to find the most skilled player in the fifth round, you won’t have a job for very long and you won’t win. It’s a lot easier to get higher skill picks at (first overall) than it is at (tenth overall). There’s going to be a guy in the draft that has the highest level of skill at a later pick, you have to find him. If you don’t want to do that, find something else to do. Lombardi used to say that we had to find two players. Didn’t matter if we had two picks, five picks or ten, we were looking for two players and I agree with that philosophy. The further down the spectrum you get the closer the players get. Its obviously much harder to get pure skill later in the draft. There is a reason why we’ve had success in the third, fourth and fifth rounds and there is a reason those players look similar. When you’re picking later your picks are going to be more homogenized. If you look at our first round picks, Thomas Hickey is much different than Brayden Schenn, who is different than Derek Forbort who is different than Drew Doughty. 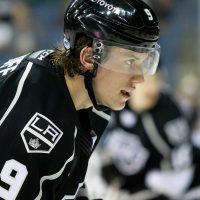 When you get to the 29th and 30th pick, you see a lot more similarity between Adrian Kempe and Tanner Pearson. They’re more similar in style and attributions. Finally, we turn back to Blake for some closing comments and additional insight into the team’s approach this weekend. Will they follow the playbook of years past and trade down a few spots, to acquire additional assets? We’ll all know soon enough. I thought Lombardi talked a lot! That’s a lot of typing, Johnny! Nice job! Well done, John. Your discerning interview of Yanetti provided readers with real insight into Kings’ approach to drafting.